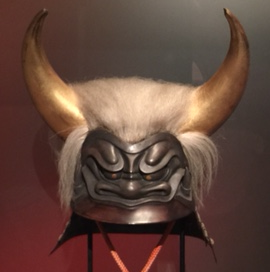 This weekend we went to the Samurai exhibit at the Denver Art Museum. 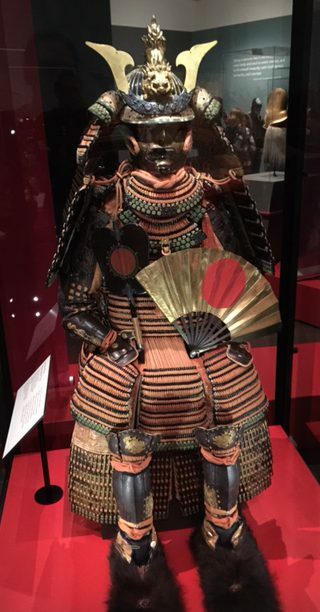 It is a collection of Samurai armor, weaponry and clothing from 1100ish to 1800ish. Just from a costumer’s perspective, the exhibit is extremely impressive–the amount of work that went into a single outfit is extraordinary, and required a large group of artisans covering a number of different disciplines. It takes on a whole new dimension when you add in the fact that the wearer needed to be protected from people with poky things (and later, from people with shooty things), and also needed to be able to ride and fight in this stuff. Imagine someone wearing this coming at you at full gallop (on an armored horse) carrying a 6+ foot bow and pointy things of his own. Aside from demonstrating your wealth, the elaborate designs were also important to make sure that you were recognized by your allies and subordinates (to avoid incidents of friendly stab). The fan, by the way, was to signal and send orders. If someone came up to you in this, it would be hard to decide whether to run or pet them on the head and offer them a handkerchief. The exhibit runs through June 5th, and is definitely worth catching if you have the chance. We also saw the Revolt 1680/2180 exhibit, which contains works by Virgil Ortiz, made using traditional historic ceramic techniques, but with many of the pieces based on a futuristic/sci-fi story line. They were very cool, but I can’t show you any since pictures were not allowed. Ideally, some of the pieces should be buried in some appropriately archeological locale so that future generations can dig them up and use them as proof of alien visitation in the distant past. I’d recommend you see this one too, but it closes on April 24th, so you have an extremely limited window. We have one rather similar on permanent display in the Ashmolean in Oxford — I rather got the impression that they were purely for formal occasions. But paper armour would be relatively light, so extremely useful against adversaries armed with, say, drinking straws or rolled-up newspapers. You are also safe from paper cuts!